I have been a volunteer tour guide for aitaijapan – Association for Independent Tourist Assistance in Japan – since 2005. I have met a variety of foreign tourists and have various unforgettable memories, even if the meeting was just for one day. All of the people are very important to me. I still keep in touch with some of them. Through my guide experience, I’d like foreign visitors to know more about ordinary Japanese life. So I have decided to open my kitchen and give you this unique experience. 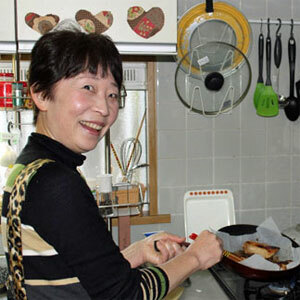 Why don’t you come to my house and enjoy cooking a Japanese home meal? Please go to Application and fill out the reservation form and send it at least two weeks beforehand. I can accept only one group ( max. 4 people) a day. The nearest station is Kawanishi Noseguchi station (Hankyu Takarazuka line) or Kawanishi Ikeda station ( JR Takarazuka line). It takes about 20 min. from Hankyu Umeda Station to Kawanishi Noseguchi Station. by express train. It takes about 30 min. from Shin-Osaka Station to Kawanishi Ikeda Station by express train. I will drive you to and from my house to the nearest station.